Immerse yourself in the region of Karangasem in our week long Bali Yoga Retreat – one of the most beautiful and unspoiled areas on the Indonesian island of Bali, far from the crowds and tourism of Kuta, but only 3 hours from the airport. Amed is best known for it’s shipwrecks and deep sea diving, snorkeling and fishing trips, as well as a place to relax and soak up the sun and enjoy Balinese Village life. Dates: 24th August at 4pm – 30th August at 1pm. 2 places left for retreat. Cost: $300 deposit (price varies according to the accommodation chosen). Payment due: Full payment by June 1st 2019. Transport to the retreat from the airport and return can be organized at enquiries@coastyoga.com.au for an extra fee. The cost for a car is approximately $65. 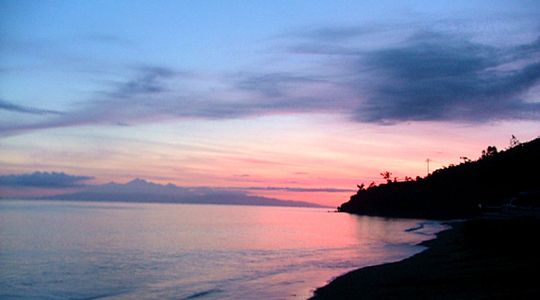 It is advisable to book return fares to Bali as soon as possible to make the most of cheaper fares. What should I expect from the retreat? A full week of yoga tuition (pranayama and meditation) – 2 hours of dynamic yoga in the morning and 1.5 hours of restorative yoga in the afternoon. The necessary equipment will be provided at no extra cost. Attendees will be taken on a day trip to visit the rice fields, palaces and temples in the area. There will also be time in the middle of the day to swim, snorkel, receive a massage or simply discover the local area. 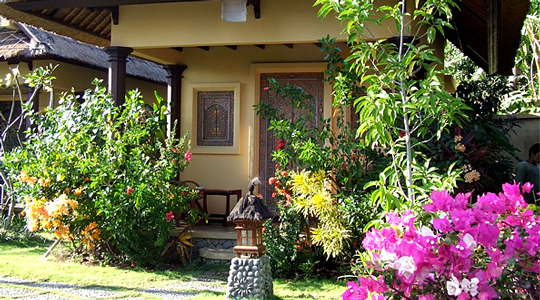 Our Bali Yoga Retreat will be held in the Life in Amed Boutique Hotel in the Village of Lean, Amed. 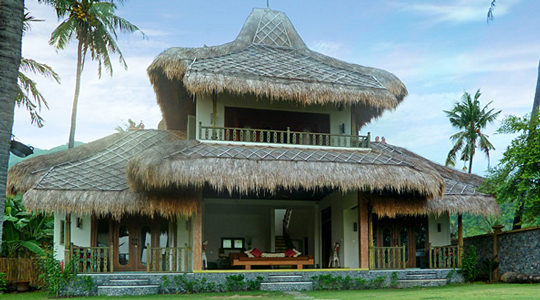 The beachfront hotel was built with a blend of Balinese and modern design. Expect elegant decor, fine bedding and furnishings, natural stone bathrooms and an outdoor swimming pool, ocean views and lush fragrant gardens. Food from the hotel restaurant is included within the price of the retreat and has received rave reviews from our guests. Sample anything from fresh fish and chicken, organic salads or spicy Balinese sambals. Decorated with Balinese and modern design, each with a king-size bed, fine linens and furniture. Upstairs has a relaxing area with additional twin beds. Each cottage has a view of the gardens and swimming pool, though each terrace has enough privacy from the fragrant flowers planted in front. There are three bedrooms, each with their own terrace facing the ocean. Each room has a colourful en-suite bathroom with outdoor showers perfect for looking at the mountains and stars. The centerpiece is a large breezy living and dining room for gathering and lounging. The Perfumed Garden rooms have king size beds, their own terrace and bathroom. The Perfumed Suite has an antique carved king-size bed, an ocean terrace, a bathroom complete with a copper bathtub and large outdoor shower, splendid views from each side and its own private swimming pool. 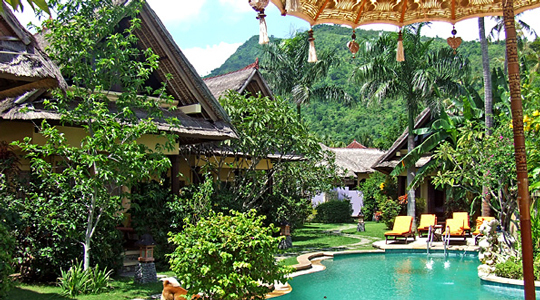 This two level villa has spectacular sunrise views from your four poster bed. The lower level looks onto the jukung boats resting on the sandy beach. There is a king-size bed on the lower level great for lounging and listening to the waves. Complete with two en-suite bathrooms made with natural stone, one on each level ideal for bathing under the moonlight. Book onto our Bali Yoga Retreat today! Choose your accommodation option above (based on a first come first served basis). Pay your deposit online (full payment is due by June 1st 2019, so you may wish to pay in full at this stage). Fill in the registration form online (when booking your place below) or at the Coast Yoga centre and let us know if you have someone you would like to share your retreat experience with.